Gabby Luvs......: OMG ITS A G.A.B. DAY AND A BDAY 2! Reading the title,you may be thinking, what does this crazy girl mean when she says G.A.B. Well, G.A.B. is an acroynom for "Gabby's Appointed Book", i know right i am such a smartie for creating that :) G.A.B. is basically my review on the books that i've read and what i would give them when it comes to my star rating (5 being the highest), now you tell me am i a topicy ( i know, not a word) person or what? Let me just start off and say that this book was not meant for a 14 year old girl like me, but i look at it in this way: I don't write stories that are meant for my age and have never been interested in books that were meant for my age. But the point is, while the book deals with some very adult situations, it involves kids, people my age. Plus i have a strong love for reading urban books, that's probably why i write them too. But to give you a fair warning: This book is not for the weak hearted and forget reading this book if your that kind of person who likes happy endings. The first chapter of this book is brutal and i mean plain dirty brutal. So brutal i cringed at it and still cringe at it, just thinking about it. The worse part of the first chapter is that instead of a grown man doing what is done is this chapter, its a 13 year old boy. The story takes place is Brooklyn, New York in Brownsville. This was another factor of why this book sparked my interest, i'm from Brooklyn and to read stories where is located so close to where i live makes me happy. That first chapter is your first taste of the mental Dreko, who is his own worst enemy. But as you go into the second chapter, you meet Lamont, an 11 year old homeless boy walking around in winter with his four year old brother Moo by his side. Lamont's mother is a crackhead and his dad died earlier in his life, with his evil aunt refusing to take them in, Lamont must find a way to take care of his baby brother and himself. After a series of events, Lamont ends up being the number one drug dealer for his sector and working under Drug kingpin Xanbar and living in the backroom of Fat Daddy's barbarshop. Reading the parts of the story where Lamont is desperate to get Moo food and keep him from the cold is just heart-breaking. So i rejoiced when he got the food and place to keep Moo at. Xanbar gives Lamont the name Hood for the fact that Lamont stands up to him and does not act like an 11 year old boy at all. Dreko, also works under Xanbar's organization and grows a hatred for Lamont as He shoots up to number 1. Lamont finds that he has an attraction to Fat Daddy's daughter Egypt and soon after living in the backroom, Egypt becomes his girlfriend. Enough explaining though, after many turns and twists in his life, the book fast forwards and starts with Lamont now 18. When reading this book, it seems as if Lamont has no one, not even Egypt, the girl he's loved since he was 11 and it is hard to not feel for him. This story is full of unpredictable events and when you get to the last chapter, you have to be happy with what has been done with Lamont's life. 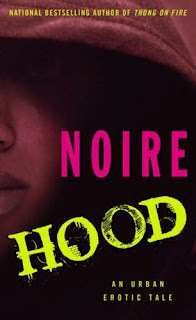 I'm a person who visualizes EVERYTHING when i read, i treat books as if i were watching a movie and Hood was no exception. The book made me cry at parts for the people invovled in it, but the story just so happened to explain what goes down in the streets of New York oh so well and it has the realistic feel all over it. Like i said before this book is not, NOT for the weak hearted. About half-way through the book, i almost stopped and said i was going to stop reading it because of just how sad it was, but i couldn't put that book down. That is why it gets 5 stars from me, even though i really didn't like the ending to it as much as it was realistic. 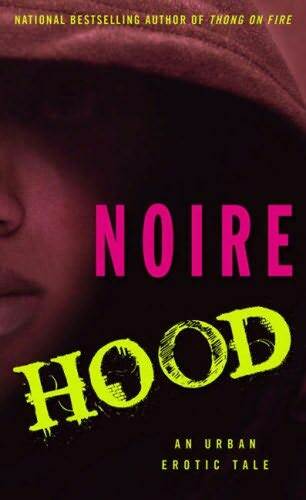 Great book, real life situations and an excellent page turner, Good job Noire.